Joel Ross debuts a thrilling adventure series in which living in the sky is the new reality and a few determined slum kids just might become heroes. Perfect for fans of Rick Riordan and Brandon Mull, this fantasy is filled with daring and hope and a wonderfully imaginative world. "Okay," Hazel finally said. "I've got a plan." "What kind of plan?" I asked. "You mean desperate and loco?" "Not necessarily," Swedish told me. "She could mean risky and doomed." "You're both right!" Hazel said, brushing braids from her face. "This one is desperate and risky." "In that case," I said. "I'm in." Driftsharks were about the size and shape o real sharks I'd seen in pictures, except they didn't have solid bodies. They were dense swirls in the Fog, with bulky heads, misshapen fins, and wispy tails. They were made of billions of tiny nanites, but they seemed like a single animal, driven to destroy any human in the Fog. "You have a bad feeling about everything," I told him. "If you ever had a good feeling, you'd get a bad feeling about it." First off, I have to say that I expected something entirely different from what The Fog Diver ultimately turned out to be. I went into this book thinking this will be something along the lines of The Maze Runner, only instead of the maze we'd have the fog. 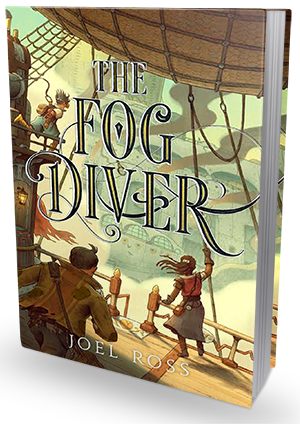 I thought the majority of the plot would be spent in the fog, but though the lead character is a fog diver, he spends very little time actually diving in the fog (we're talking maybe 10 pages total). I kind of had this idea that this book would be about exploring the fog, fighting the dangers lurking inside it, maybe getting trapped down in the fog covered areas and racing against time, trying to stay alive. I don't really know what I imagined exactly *shrugs*, but it definitely wasn't what I got. The majority of the plot plays out while the characters are flying around on their air-raft, trying to escape mutineers and lord Kodoc, or get from one place to another. Chess is a freak. He was born in a cage, down in the fog, and he has one fog-filled eye to always remind him of the fact. The fog is actually not just some meteorological anomaly, it's a cloud of nanites, designed to fix the smog covering the Earth. These nanites were meant to heal the Earth and keep it clean, but they took the cleaning process to a whole new level, deciding that the human race is the source and cause of pollution, and, therefore, humans have to be kept out. The fog attacked humans, killing millions and driving the rest of them up to the highest peaks of Earth, where they were forced to live above the fog level. Chess and his crew are scavengers, searching the fog for anything that could be salvaged and then sold (usually for food and clothing). Chess is, of course, the diver. He is the one who goes all the way down to look for anything valuable. His nanite-filled freak-eye somehow protects him from the fog-sickness. As it turns out, his "freakiness" is no accident. He was "made" this way by lord Kodoc, who wanted someone he could use to find the machines that control the fog. Because, if you control the fog, you control the world. And now Kodoc is after Chess. This was a good story that moved along at a nice, even pace. I thought Chess was an interesting character and the supporting cast was strong,too. I liked the diversity and how each of them was so unique. Chess is only 12, which supports my theory that this is most likely a middle grade novel (GR doesn't specify the age level, I initially made the assumption that this was a YA novel, but the writing is more fitting for Middle Grade crowd). It's most definitely an entertaining story, filled with good-natured humor (lots of little pop culture anecdotes that will make you chuckle), amusing dialogues, fast-moving action and mostly unexpected twists. I think it's a great book for young boys, particularly those who happen to be reluctant readers. The writing is easy to absorb, mostly dialogue-based and it should keep them captivated. It was a little bit too immature for me, but I still enjoyed it quite a lot.